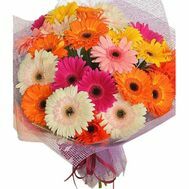 Gerberas certainly remind you sunny sunflowers or a modest daisy. The name of this flower is the name of a mythical nymph, which, not wanting to be the center of attention, has become a charming but wild flowering plant. His homeland is South Africa. However, these flowers also grow on the lands of Latin America, Mongolia, China, Australia, Madagascar, India and Japan. 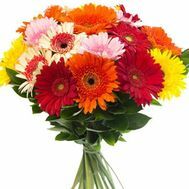 Diameter of gerberas is 4 to 15 centimeters, some varieties even reach up to 30 centimeters. Their coloration is striking in its variety. There are almost all colors except blue. 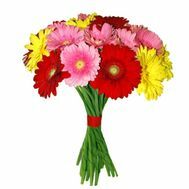 There are gerberas of simple and double appearance, with a dark and light middle. 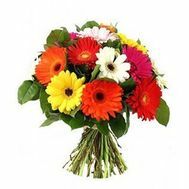 Bouquets of gerberas are a magnificent gift to a man of any gender and age. 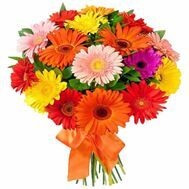 After all, these representatives of the flora, symbolizing warmth and sunshine, will give a wonderful mood and remind you of carefree summer days. Gerbers of any color in the number from eleven to fifty-five are made into beautiful bouquets by skilled florists. 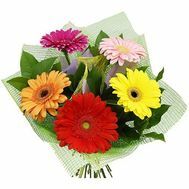 The delivery of bouquets of gerberas is provided by our online store. There is a belief that these flowers patronize those born in April. 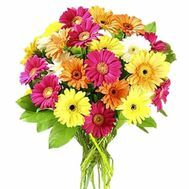 So it's safe to give birthday bouquets of gerberas to those who came into the world this spring. 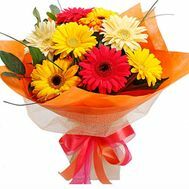 Delivery of flowers is not particularly expensive, and the joy of the bouquet will exceed all expectations. These charming with elegance and tenderness flowers can be safely used in wedding floristics. 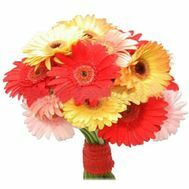 Although, unfortunately, the compositions of gerberas are rarely used as wedding bouquets. And they have a lot of advantages over other colors. The presence of the gerber shop does not depend on the time of the year. They endure the whole ceremony steadfastly, without losing freshness. And after the wedding they will please the newlyweds for a long time. 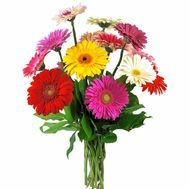 The price and delivery of flowers is available to people with any income. 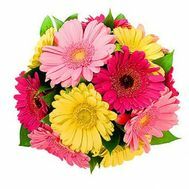 Varied colors and shades, especially if huge bouquets of gerberas are made, allow to decorate the celebration inimitable. These flowers are good both individually and in combination with other plants. 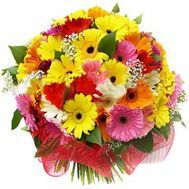 In addition, as a rule, florists do not need additional decorations to compose a bouquet. Gerberas are good in themselves. The only drawback is the presence of a heavy flower head. However, florists have learned to cope with this small flaw. The wire, neatly inserted into the stem, fixes the flower itself, not allowing it to bend. 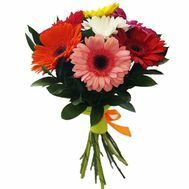 Masters of flower design will do their best not to overshadow your celebration, and the delivery of bouquets of gerberas to any point of Ukraine from our online store will surprise with its efficiency.